The premise of Dying Of The Light—in which a CIA agent in the early stages of frontotemporal dementia must race to assassinate his terminally ill arch-nemesis—is a textbook example of pulp existentialist inquiry. The clichés of the airport-bookstore spy story have been moved around like magnet poetry until they spell out something meaningful about meaninglessness, something about what it means to kill a dying man for a wrong you won’t remember in a few years. 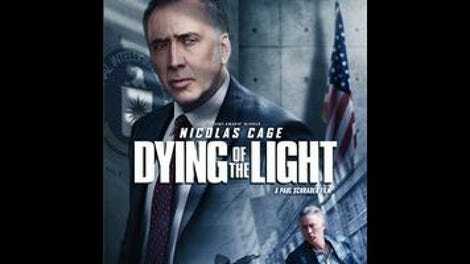 Add in the fact that said CIA agent is played by Nicolas Cage, an actor whose wild mood-swing style already resembles the early symptoms of dementia, and you’ve got the makings of a pretty good movie—which Dying Of The Light isn’t, for a number of reasons. Dying Of The Light comes preceded by a wave of bad hype, much of it coming from the mouth of executive producer Nicolas Winding Refn. The story goes that director Paul Schrader had a falling out with the backers, and was shut out of the editing room while the movie was drastically re-cut and re-scored. (This is not the first time something like this has happened to Schrader; Warner Bros. opted to re-shoot his prequel to The Exorcist with a different director, though ultimately, both versions were released.) And, for what it’s worth, Dying Of The Light sure looks like a severely compromised production, with flashbacks and montages that appear suspiciously to have been cut out of longer scenes. Not to say that the movie is a mess. Instead, it plays out as a more or less conventional direct-to-video-style thriller, distinguished by a handful of subtexts and images that might have been developed in a different version, but here register as mere quirks. CIA veteran Evan Lake (Cage, hair completely gray and wearing a chewed-up prosthetic ear) comes across evidence that Muhammad Banir (Alexander Karim), the man who captured and tortured him two decades ago, is alive, but dying. Nobody seems to care about Banir—who’s been off the grid and out of the loop since the 1990s—except Lake. Factor in the ticking clock of Lake’s dementia, which manifests itself in poor impulse control and a tendency to garble words, and what you’ve got is one quixotic quest for vengeance. For assistance, Lake brings along a Sancho Panza figure named Milton Schultz (Anton Yelchin), an Agency desk jockey who’s willing to sacrifice his career in exchange for one shot at the kind of cloak-and-dagger fieldwork he always dreamed of. By all accounts, Schrader’s departure from the production was motivated by disagreements over the focus of the movie—namely, the people financing Dying Of The Light felt that the director’s original cut wasn’t the tense thriller they paid for. Neither, incidentally, is this movie; Lake’s search for Banir is a fairly straightforward process of going from point A to point B and finally point C, and no amount of generically exotic music is going to make it seem exciting. And yet, it’s possible to see the outline of another movie, probably the one Schrader and his stars intended, a portrait of a self-destructive loner whose emptiness is linked, in some inextricable way, to the mechanics of the War On Terror. The blank gray offices at Langley, the anonymous stairwells and airports, the wide-angle shots of impeccably clean hotel rooms—so much of the movie’s visual language suggests an emptiness begging to be filled.